Shakespeare’s Rebel | AUTHOR. ACTOR. SWORDSMAN. Click HERE to read the tale of this extraordinary evening! “Especially powerful is the portrayal of Shakespeare as a real man, one who can bewitch the masses with his Hamlet yet cannot contain his sorrow for his own dead son. Now available in the UK in March 2013, Canada June 2013 and the US… to be determined! But it has just been bought by my great publishers, Sourcebooks. Sounds good. Is an audio version likely at all? In all you book stores, that have your new novel, you omitted Goldsboro, my favourite and where I just purchased your newest novel. to mention being being a Tudor history buff I cannot praise this novel too highly! period left me full of admiration for his skill in weaving together known historical facts and producing such a ripping yarn. I didn’t want it to finish! Rosemary, thanks so much for this. I wonder if you’d consider putting it up on Amazon and/or Goodreads as a review? It thrills me when someone who knows her stuff obviously just gets the book. Always makes my morning! Hi Chris happy to ! However my husband does so look under Sprocket and you should see the review. He couldn’t resist tidying up my grammer and spelling! He is a writer too. I do have an amazon account and will post on it today!!! Just finished this wonderful book, which charted the often exasperating choices of its hero through the world of Elizabethan London. I loved the descriptions of Bankside, I used to spend many an hour wandering those streets when I was a volunteer at the old globe Museum, and watched the first timber been driven n for the 20th century Globe. The story compelled me onto finish it in just a couple of days and despite the several hints I was left surprised and warmed by the conclusion. 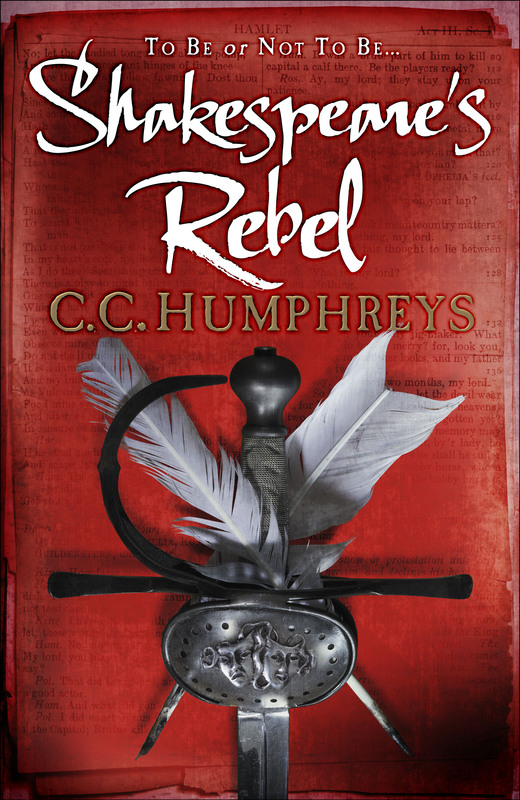 Hi Chris, Wanted to say the Shakespeare’s Rebel book launch was easily the best launch I have ever attended. I loved watching your expressions as you listened to others say their lines and read your book aloud. Your enthusiasm for all things Bard is awesome and you’re a pretty good swordsman too. 2 things I learned: Most people would last about 15 seconds in a sword fight; and story time at your house must be amazing. Shakespeare’s Rebel is a staff pick at Book Warehouse. Hope we can help you sell a lot of copies. Oh, thanks so much, Darlene. As you saw I so enjoyed it and was very moved by the reaction. My kind of night! Hope you sell shed loads! “Absolutely” loved it. Huge fan; the era, the adventure, the humour. Have not read the Absolute series, but after this novel, I certainly will!! Have read and relished the French Executioner series (highly recommend reading those as well either before or after Shakespeare’s Rebel) and Vlad. Thanks for keeping this east coast Canadian entertained!! Thanks, Colleen, delighted you so enjoy the work. A visit to the East Coast sounds a must! Pingback: Words = Energy Squared: Hearing my play | AUTHOR. ACTOR. SWORDSMAN. I really enjoyed your talk/performance at Bard on the Beach. Thank you. I read Shakespeare’s Rebel before seeing the play and enjoyed both. I don’t usually write to authors but somehow I felt strongly about this – a tribute to how well you wrote the book! I have not read any of your other books but intend to do so after reading Shakespeare’s Rebel. Penny, thanks so much for taking the trouble to write these very valid comments and concerns. I think you make a very good point about John’s character. Alas, the necessity of the stage requires a lot of changes, cuts. Also, I feel a different take on production and character might have given you the feeling for John you require. Beyond my control, I’m afraid. Maybe next time! But I certainly take your comments on board. I am a student from Washington and Lee University in Virginia. I have just finished Shakespeare’s Rebel and thoroughly enjoyed it! It is such a fun read, and quite informative! You’ve created some wonderfully complicated and lovable characters, and enough action to capture the attention of any modern reader! I am currently working on an Essex Timeline, which has compiled entries of books, images, poetry, etc. that have mentioned Essex after his death, providing information and analysis. I am writing the entry for Shakespeare’s Rebel, and hoped to ask you a few questions! You mention in your author’s note that a lot of your inspiration came from the play Hamlet. Which of the characters did you intend to be the most Hamlet-like? I was also wondering–where did your interest in Essex come from? Lastly, I noticed that John Lawley changes his last name to Absolute at the conclusion of the novel, and you have another series entitled Jack Absolute. Is there any relation? Thanks for taking the time to read this, and thank you for writing such fascinating works! So glad you enjoyed the book. It is one that is close to my actor’s heart. Interesting that you are doing an Essex timeline. Why? An assignment? I really think that when writing Hamlet, WS was, as ever, influenced by current events and personalities. And Essex was one of the largest of those. I think there were aspects of Hamlet about him – the indecision for one, the failure to act when he needed to. I also gave him Hamlet’s wonderfully accepting line: ‘Let Be.’ Made up of course, but dramatically it worked for me, to have Essex have some sort of realization at the end of his life. Though Essex is not close to the intellect that WS makes the Dane. But I gave some Hamlet aspects to other characters too. The novel is all about fathers and sons, as Hamlet is to, of course. Fascinating, tragic character, Essex. Hubris writ large, Very Shakespearian, hence my interest. Yes indeed I am trying to tie all my novels together through characters. John Lawley is the grandson of Jean Rombaud – The French Executioner, my first novel. He is also the great great great grandfather of Jack Absolute. Thank you for the reply, the Hamlet angle fits the story well! I am actually doing summer research with a professor here, and am contributing to his Essex project. I love literature, so it has been such a fun way to spend my summer. This has definitely been helpful. I hope you don’t mind if I ask you one more question: What inspired your take on the ring story? It’s seems there are two threads, one with the handkerchief and the other an actual ring. I really shouldn’t reply, since you are still Anonymous! I tried to include some myths around the subject too, give them a basis of fact. (I do a lot of that in my book about the Real Dracula – ‘Vlad’). The ring seemed plausible to me, enough to build on the love I created between Essex and Elizabeth. The handkerchief was a useful extra device. Do send me a link if the Essex project goes online. Sounds interesting.